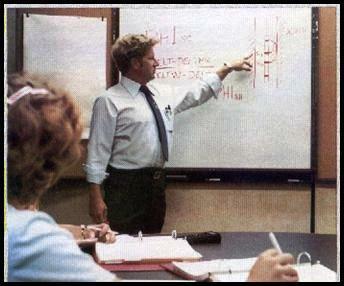 We have successfully offered a variety of practical, no-nonsense petrophysical training courses for over 35 years. If you qualify, you too could take part in this rewarding career path, using our tried and tested proprietary seminar materials. The world market is huge and many local areas are not served effectively by any form of in-house or commercial petrophysical course presentations. Each seminar is supported by a full colour Reference Manual and a visual presentation with practical exercises. More than 20 spreadsheets can be used to demonstrate the calculations. These lectures are time-tested in major and independent oil companies, service companies, universities, and government agencies around the world. The slide shows are narrated as an aid in preparing your own personal presentation. You can add, delete, or edit slides to customize the show, or combine lectures to suit a particular client's needs. You can add exercises that reflect exploration and development activities in your local area. Compare our quality training materials to any others in the marketplace today. Upon payment of the license fee, you would receive a non-exclusive, worldwide license to use specified copyrighted intellectual property of E. R. (Ross) Crain, P.Eng. for the sole purpose of presenting seminars and courses on petrophysical topics based on this material. 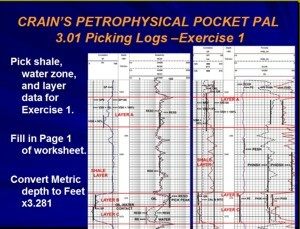 Course outlines for individual petrophysical seminars that can be mixed or matched to suit a client's requirement. PDF files of Reference Manuals that can be reproduced for seminar participants as needed. You can replace exercises with those from your own experience in your local area. PPT files of narrated slide shows covering a total of 2 to 14 days of presentations, depending on which course modules you purchase. Add, delete, or replace slides to personalize the presentation. XLS files for 20+ spreadsheets for demonstrating petrophysical calculation methods. An endorsement and links on this website to your course presentation topics and dates. A degree in Engineering or a Geoscience from a recognized University. Minimum 10 years of recent oil / gas / mineral industry experience. Expert-level knowledge of petrophysical methods and algorithms, parameter selection, data quality control and repair, and integration of well logs with sample description, gas log, core, test, production, XRD, geochem, and other pertinent data sets. A gift for lucid oral presentations, a willingness to be "On Stage" for 8 hours a day for several days straight, and the ability to market your professional services locally or worldwide. A strong desire to teach others the skills and benefits of quantitative petrophysics. WANT TO BECOME AN ASSOCIATE INSTRUCTOR ? Email Us a copy of your resume with your request. If you have the experience to become an Associate Instructor, you may be acceptef, but we reserve the right to refuse any application without giving any reason. Then go to www.spec2000.net\00-av-training.htm and follow the instructions to order the course materials that you wish to use in your courses. Click "Course Details", read about the course content, then click "Buy It Now'. After you click a “Buy It Now” button, enter “10” in the “Quantity” box on the PayPal order page. Click “Update”. Then complete the balance of the PayPal screens. We do not accept any other method for ordering and payment for trsining products. When you have completed these steps and payment has been accepted by PayPal, we will email a PDF copy of your Associate Instructor License with the pertinent details filled in. This will allow you to demonstrate to potential clients that you are authorized to use the copyrighted intellectual property. If you breach any conditions of the Licenses, your right to use the training materials will automatically terminate. When you schedule courses based on this agreement, email me with the dates and location, and your current contact information, and I will place the information on my website to assist your marketing efforts.